Perhaps no duo has reached farther and deeper into current pop culture than Phil Lord & Christopher Miller. Their recent movies have plundered the DC Universe, an alternate version of the MCU, and even a little bit of the Galaxy Far, Far Away. To date, their most unexpected success came with 2014's The Lego Movie, an animated effort given up for dead by some critics until it surprised and delighted with its wit, cocky attitude, and pop cultural eviscerations. While the inevitable sequel was in development, Warner Brothers rushed a couple of lesser "siblings" into theaters (both released in 2017): The Lego Batman Movie and The Lego Ninjago Movie. The former retained a vestige of the elements that made the 2014 feature appealing but the latter seemed tired and derivative. Now, five years later, we finally have The Lego Movie 2, which continues the story where the first movie left off - with an attack on the planet by aliens from the planet Duplo. 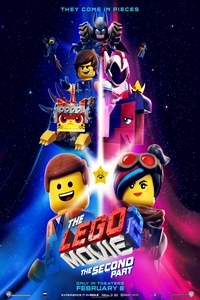 Most of the familiar characters are back - wild-eyed optimist Emmet Brickowski (voice of Chris Pratt) and his brooding girlfriend, Lucy (Elizabeth Banks), gravel-voiced Batman (Will Arnett), glitter-loving Unikitty (Alison Brie), pirate MetalBeard (Nick Offerman), and spaceman Benny (Charlie Day). They are joined by a few newcomers, including the masked General Mayhem (Stephanie Beatriz); the stubbled adventurer Rex Dangervest (Chris Pratt), whose spaceship is crewed by velociraptors; and the ambiguous Queen Watevra Wa'Nabi (Tiffany Haddish) - pronounced "Whatever I wanna be." After five years of intermittent war, the "awesome" world had been turned into a Mad Max-inspired habitation called Apocalypseburg. When the Duplos try the new tactic of abducting Lucy, Batman, Unikitty, MetalBeard, and Benny, it's Emmet to the rescue (with a little help from Rex and his raptors). Conquering his fears, he heads up the stairs and into the unknown, trying to avoid the pit of loneliness underneath the washing machine to rescue his friends and keep the entire Lego-verse from being tossed into the storage bin. The Lego Movie 2 has enough material for a 30-minute short but, at more than three times that length, things get stretched a little thin. The level of sophistication is down a notch from the first film and the live-action aspects (featuring Maya Rudolph and Will Ferrell's voice - he physically stays off-screen) aren't as well-integrated. They're a given instead of a surprise twist. It seems like Lord & Miller are aiming for something similar to the Toy Story movies - using toys as a means to track real-life growth and development - but the results aren't as successful. One of my problems with the Lego spin-offs is that I didn't find the action sequences to be innovative, interesting, or invigorating. In The Lego Movie, they were fun because of the uniqueness of the "Lego effects," but that bit of visual magic wore off after one picture. The Lego Movie 2 features a lot of battle and chase scenes - fine for kids but a little tedious for adults. There are times when the film seems to be struggling with its raison d'être and never really comes up with an answer beyond the obvious financial one. The movie, mindful of the current cultural climate, elects not to make Emmet the hero this time; Lucy gets to don the white hat. As was previously the case, Will Arnett's Batman steals the show. As in The Lego Batman Movie, there are references to all the previous live-action Batmans - West, Keaton, Kilmer, Clooney, Bale, and Affleck - although, in terms of tenure, Arnett has now eclipsed all but two of those. Celebrity voice cameos abound, including Channing Tatum (Superman), Jonah Hill (Green Lantern), Jason Momoa (as - who else? - Aquaman), Ralph Fiennes (Alfred), and Bruce Willis (Bruce Willis). When The Lego Movie was released, the concept of openly satirizing pop culture iconography was relatively new. Deadpool, which turbo-charged it, was still in pre-production. The Lego Movie 2 doesn't add a lot and at times it seems to be trying to hard to be funny and hip, although it scores a few solid blows. There are multiple versions of several DC characters representing their different iterations through the years (Aquaman and Wonder Woman). Bruce Willis shows up crawling around in air ducts. And the end credits music is a song about how great it is to sit through the end credits. So what do we have with The Lego Movie 2? A moderately entertaining but overlong film that emphasizes visual razzle-dazzle over narrative backbone. It's funny at times but this brand of cleverness has lost its freshness in recent years due to frequent use. Kids will enjoy it more than adults, although there's enough to keep older viewers from zoning out (at least most of the time). By this point, however, I think I've had enough of The Lego Movies. These things can only go so far and I think they may have exceeded their natural life span.